Free download Beautune Latest Version. You can’t always look your best in every photo… When you need a touch-up, you don’t need to pay a makeup artist or learn Photoshop. Do it yourself, quickly and easily, with Beautune and our complete makeover kit. Our app has the best interface that will quickly let you share the best of you with the world! Use our complete make-up kit, along with smoothing and wrinkle removal tools to highlight everyone’s best features. And the ultimate reshaper lets you gently nudge features in the right direction. 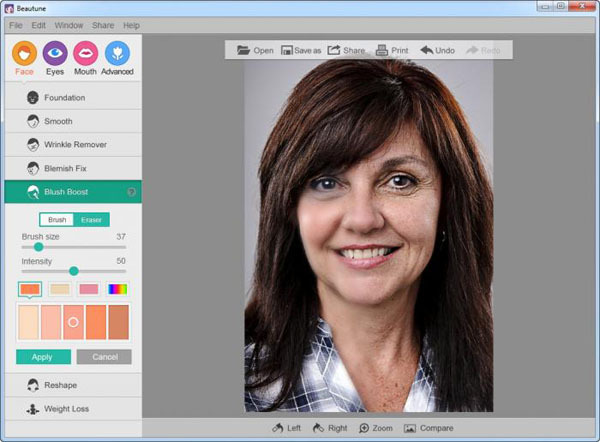 All these features and more, together with a beautiful, easy-to-use interface, will have you fixing and sharing your portraits in seconds. Use the reshape tool to gently sculpt your features or fix bad camera angles.Focus on what’s important, you! Use our defocus tool to blur out the rest and make the viewer see what matters.